Crystal Palace XI: Hennessey, Ward, Dann, Delaney, Souare, Zaha, Cabaye, Jedinak, Ledley, Bolasie, Adebayor. "We're going to win the league," sing the jubilant Leicester fans, understandably, and the Foxes players have just been across to thank them for their support. A reminder before I go that this win leaves Leicester eight points clear at the top - for reaction from Selhurst Park head here, or read a developing match report here. Another step closer to the title for Leicester! Leicester get lucky here... twice. First Kasper Schmeichel makes a hash of a ball into the box and sees the ball bounce wide off Leonardo Ulloa's head. Then, from the resulting corner, Scott Dann's header finds Damian Delaney, who chests the ball down before thundering a shot against the bar. Three minutes of stoppage time at Selhurst Park. Jamie Vardy is going off, to be replaced by Daniel Amartey. Palace are still in this game, but only because Damien Delaney gets across to put in a last-ditch tackle to deny Jamie Vardy, who had burst clear into the box. Great play by the Leicester striker - in the stands, England boss Roy Hodgson nods approvingly. Another Leicester change - off goes their goalscorer, Riyad Mahrez. Jeff Schlupp is coming on to help them try to see this one out. "It looks like Alan Pardew has aged by five years during the course of this game! 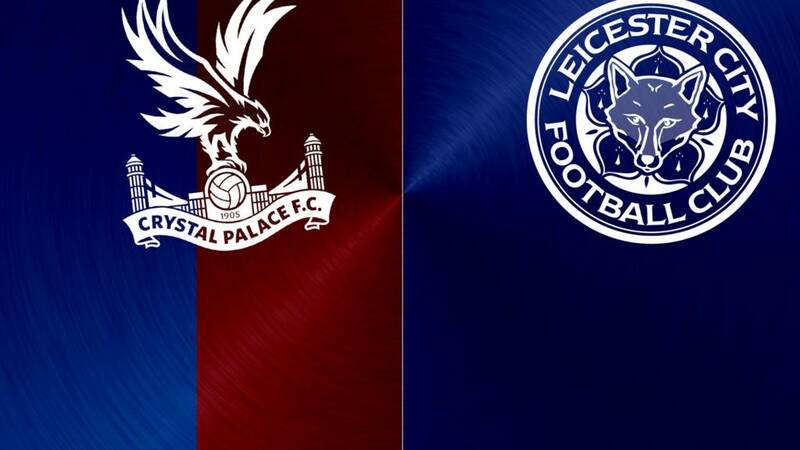 "Palace are as desperate for the points as Leicester, for completely different reasons. This has been such an honest game." Palace's best hope of getting something from this game remains Bakary Sako. He lets fly with a thunderous strike from 25 yards, which is parried by Kasper Schmeichel... this will be a big 10 minutes for Leicester's title hopes. I thought you were supposed to swap shirts after the game? Scott Dann gets hold of Robert Huth at a Leicester corner, and pulls his shirt clean off. Leicester's first change sees Leonardo Ulloa on for the hard-working Shinji Okazaki, who has put in another shift. Tell you what, Bakary Sako can shoot too. He pops up on the right this time, cutting inside before letting fly... but Kasper Schmeichel is in the right place to keep it out. Bakary Sako can definitely pick out a decent cross or too - the Palace substitute puts in another delicious delivery, but Yohan Cabaye was the only man in the box who was anywhere near it. "Wes Morgan and Robert Huth are like two bouncers at the heart of that Leicester defence. If your name's not down, if you're not on the list, you're not coming in!" "Palace are sinking down that table fast. Alan Pardew will have beaten the drum again at half-time." Palace are persevering, though... they keep firing in those crosses, to no avail. Leicester are under pressure, but are dealing with everything thrown at them at the moment. Danny Drinkwater has shown today why he is now in the England frame - the Leicester midfielder, named in Roy Hodgson's latest squad this week - helped work the ball upfield with a series of quick-fire passes - only the final ball, aimed for Jamie Vardy at the far post - goes astray. Could Leicester regret their missed chances? Palace are still plugging away, and Bakary Sako just put in a peach of a curling cross from the left. Nobody in the box to get on the end of it, though. Another Leicester chance, and they should really be 2-0 up. Christian Fuchs launches a long throw - Stoke style - into the area and Shinji Okazaki steals in to get on the end of it, but sends his header over the bar from point-blank range at the near post. Yohan Cabaye fires it in - straight down Kasper Schmeichel's throat. He elects to punch, rather than catch, and immediately launches a counter-attack. It comes to nothing but that is the way Leicester roll.